Your wedding day is one of the biggest days of your life. From our first meeting through to your big day, I am committed to providing you with the very best service, to make your wedding day perfect and the whole experience seamless. It is important to have a Marriage Celebrant who will listen to your needs and be flexible andÂ accommodating to enable your wedding to be as you dreamed. I encourage unlimited consultation,Â in person, by phone,Â Skype or email and welcome overseas enquiries. Every contact is very important and valuable. In a comfortable and relaxed atmosphere we canÂ discuss your special day. These meetings can be anywhere that is mutually convenient – such as myÂ place, your place or a coffee shop. I carefully explain the basic format of a wedding and clarify the legalities, to ensure you have a fullÂ understanding. Then it is over to you to create your own unique and personal ceremony. Of course IÂ can offer suggestions and provide resources to help you. 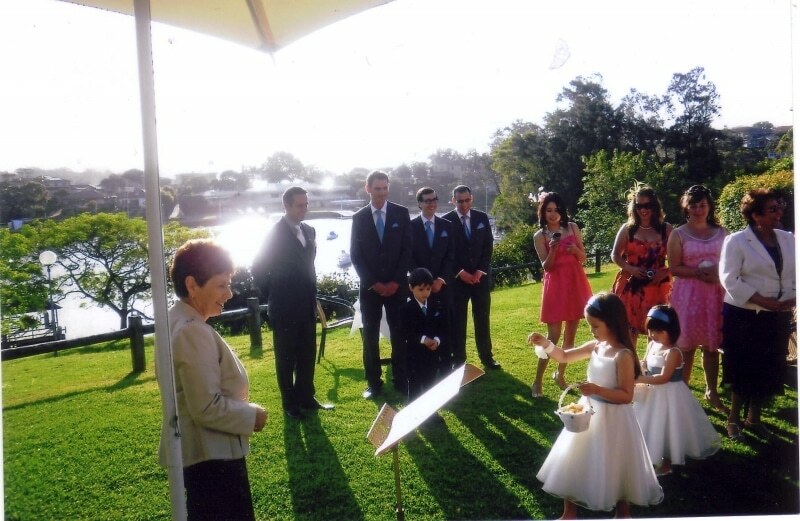 I can have as much or as little input into theÂ preparation and the ceremony as you would like. Poetry, cultural and religious rituals and customs, can be incorporated into your wedding ceremonyÂ if you wish. To top off your ceremony, I suggest an order for the ceremony, to suit and balance thecontent. My aim is to create a truly personal, meaningful ceremony which genuinely reflects you as a couple. My celebrant fee and fee structure is clearly discussed at the first meeting, and is complete, with noÂ hidden extras or add-ons. Couples are provided with a comprehensive package to assist them, including samples of vows,Â poems and other relevant information. I will ensure that no other ceremony has been booked too close to your wedding and ample time is allowed. I will dress to fit in with your wedding.